Model L5008-One Size Fits Most! The Schiek Leather Dipping Belt is equipped with a chain allowing the user to add weight plates. While traditionally designed to add resistance to exercises that depend on one’s body weight for resistance, such as a chinup or dip, they may be used in several other types of workouts as well. 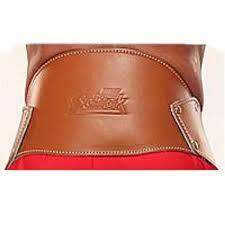 With the Schiek Leather Dipping Belt you can add unlimited weights which will challenge your exercise program. Since you are able to continually add pounds to your dip strength you will rapidly build upper body mass. Make sure you do not overload your dipping belt to minimize your risk of injury. Warm up before your workout by performing a few minutes of light cardio and dynamic stretches for the muscles you are about to work and increase your weights slowly over a period of weeks to further avoid injury. If you have been sedentary or ill recently or are new to exercise, check with your doctor before starting a new exercise routine. Order your Schiek Leather Dipping Belt - Model L5008 from FitnessZone.com today!